Huron County Library generally does not own the rights to material in the digitized newspaper collection and, therefore, cannot grant or deny permission to publish or otherwise distribute the material. It is the responsibility of the user to seek permission from the copyright holder for any purpose other than research and private study. Having problems/errors while searching? First go to “search” on the upper lefthand of Laserfiche Weblink. 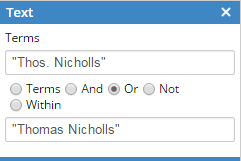 Try hitting “reset” at the bottom of the search pane & then customize your search parameters! Use “Text” to make your keyword searches more successful and use “Field” to search by city or date. Use ‘General Search’ to find specific issues of newspapers by title or date quickly. ‘General search’ is the automatic search option you will see when you look at the newspapers for the first time, and works for simple keywords or information in a newspaper’s title. Each newspaper is named according to the title, date and page number. To quickly find a specific newspaper (ie “Exeter Advocate”) or specific date or partial date (ie 1880-1-1), type them into the “general search” bar. For example, typing 1880-11- will bring up every newspaper from November, 1880 (as well as instances where 1880-11 appears within a newspaper). Use quotes to significantly specify & reduce the number of results you see. If you put quotation marks around your search term, results will only show those instances where a combination of words occur together in that order, rather than instances where they appear on the same page coincidentally. Select ‘within’ to narrow results to instances when the terms appear within a certain proximity to each other (ie search “Trinity Church” within 10 words of “Blyth” to help eliminate or reduce results for any other “Trinity Church”). This will help you narrow the results, even when you’re not sure what order the words will appear in. Use ‘or’ to find more relevant hits & save time! Use an asterisk for wildcard searches to get more results! Searching for “John Al*n” will show results for John Allin, John Allen, John Allan, John Alan, John Allyn, John Allison, etc. Typing an asterisk (*) within your search term will return results with multiple possible characters in its place, finding variations on the same root word (ie searching for jail* will also return results for jailer, jailed, etc) or misspellings of names. Use ‘within folder’ to search within specific folders! As well as being keyword searchable, the newspapers are organized by community and date. Choose a community name or date by clicking on ‘browse by year’ or ‘browse by town” on the >newspapers screen. 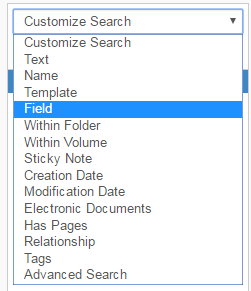 After you have chosen the folder you would like to search within, select “Search,” and then add “within folder” to your search pane. Now when you search for text or a specific field, the results you see will only originate within the folder you selected (ie > Newspapers > Browse by Town > Exeter > 1899). Don’t see the community you want to research? Search anyway! You may still find lots of results: Huron County papers covered notable regional, national & international stories, as well as carrying items from other local papers. If the organization you’re searching for was in Brussels, you might still find a mention of it in a Wingham newspaper if a Brussels paper doesn’t exist for that time. The OCR (optical character recognition) program that reads the files is not perfect—if your subject turns up no results on an initial keyword search, you might be able to read relevant information with the human eye that the OCR has missed if you search by date-especially for badly damaged or faded issues.